Jimmy Olsen is strapped into some kind of operating chair, with his hand pinned down on a side extension and a very unpleasant-looking contraption descending onto that hand. At the control of the contraption is Lex Luthor, brandishing paper puppets of various DC characters and asking Jimmy how he thinks his heroes will die. 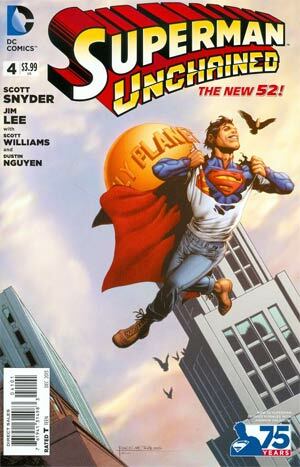 When he gets to Superman, Lex says the craziest thing about his death is how soon it will happen. 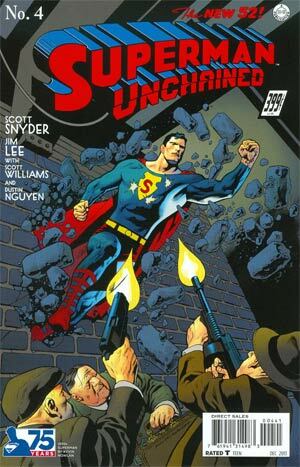 Superman, meanwhile, is where we left him: in Tokyo with Wraith fighting off the Ascension-controlled Russian drones. 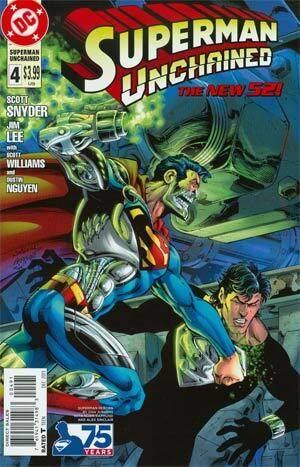 Now we learn that the drones fire red solar bullets that weaken Superman, but not Wraith. As they fight and ultimately repel the attack, Wraith teaches Superman a few things about his powers and they talk about what Wraith meant when he said (end of last issue) he'd soon have to kill Superman. If the answer is really just that Wraith blindly follows orders (my charitable definition of duty in this kind of context), I'm disappointed. While all of this is happening, Lois discovers that the mysterious man who rescued her on the coast of Nova Scotia is in fact an Ascension defector, who begs her to take a crystal shard he says Ascension doesn't know he has and that means everything. He also tells her that Superman will soon be dead just before a group of Ascension agents arrive and take her into their custody. 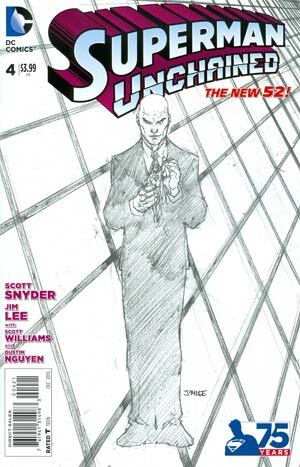 Eventually, Luthor tells Jimmy how Superman is going to die: Jimmy is going to kill him! 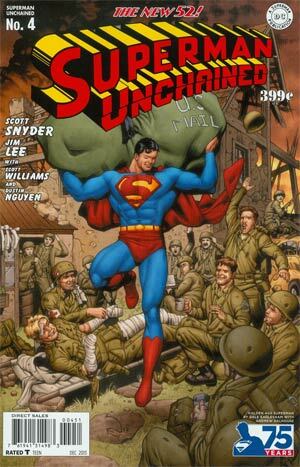 And, finally, Lois Lane learns that her father the general is responsible for Ascension. Story - 4: Ok, then. Well, that sounds pretty good to me. 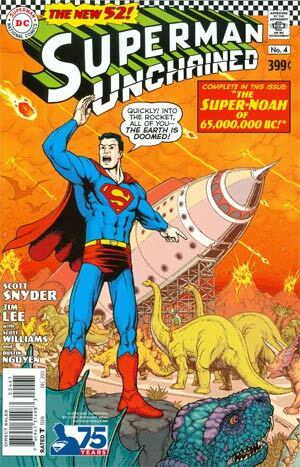 I've heard some fussing over just what effect red solar radiation is supposed to have on Supes anyway, a minor point but fair game because the New 52 has been inconsistent about that (especially with the latest business where Superman is on Krypton and is only slowing losing his yellow "charge"). 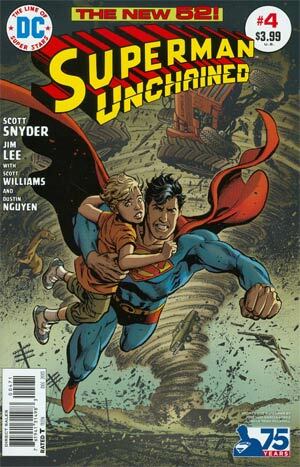 It's also hard to see where in the New 52 timeline any of this story fits, for instance Lois off crashing airplanes in Canada instead of turning into pure energy or whatever and coming to understand that Clark and Superman are one and the same. But forget all that. This story right here is beginning to sow some genuine intrigue. A crystal shard that is said to resemble Kryptonite but isn't. Sam Lane behind (though I suspect not fully aware) of a global terrorist organization. Whatever Luthor's doing to Jimmy and especially whatever's going to happen next. These are all pretty big pieces of a clearly bigger puzzle that I'm expecting will be whittled down to more manageable size before we see them brought together. Indeed, because so much of what's going is still very open-ended, it's hard to find a center on which to base this review. (No doubt you can tell.) 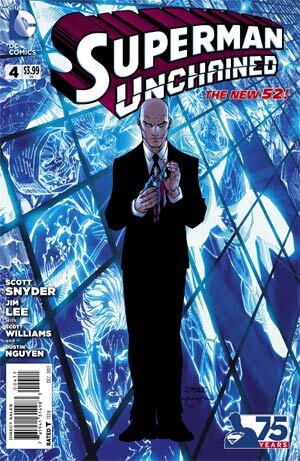 I'm inclined to say that Luthor's puppets are everything... consider that Wraith's admission to Superman that when the time comes he will do his duty and take Superman down effectively reaffirms Wraith as Sam Lane's puppet; in one panel last ish, we see Luthor strapped to an exoskeleton of some kind, seemingly remote controlled (it may have been a clone); Jimmy is pretty clearly being prepped to act as a puppet for Luthor; Superman is afraid of being controlled. So watch them, those puppets, those paper puppets - easily destroyed, Luthor implies, and not so easily made. 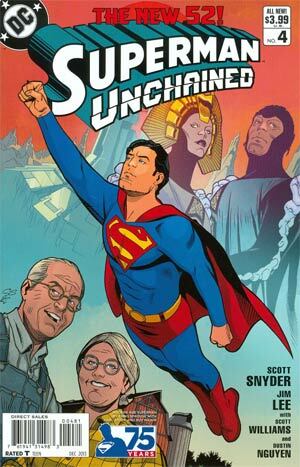 Maybe Superman already is being controlled, doesn't realize it, Wraith will be the expediter of his "unchaining" and out the other side will come the wise and serene Superman we're all waiting to see emerge in this new continuity. Art - 5: And Jim Lee's work always hold my attention long enough to count. More than a little busy when he gets carried away, but whatever. Cover Art - 4: Eleven covers this month, though?! I got the one with Luthor in the center holding his paper Superman puppet. Great cover. But 11 of them?! I really hope only a minority of readers and collectors is buying them all. Because that's ridiculous.